Verizon bumped up its Android lineup on Wednesday with the announcement of the Motorola Droid X2. The sequel to the Droid X will be available for $200 (with a new, two-year contract) on May 26--pre-orders start May 19. 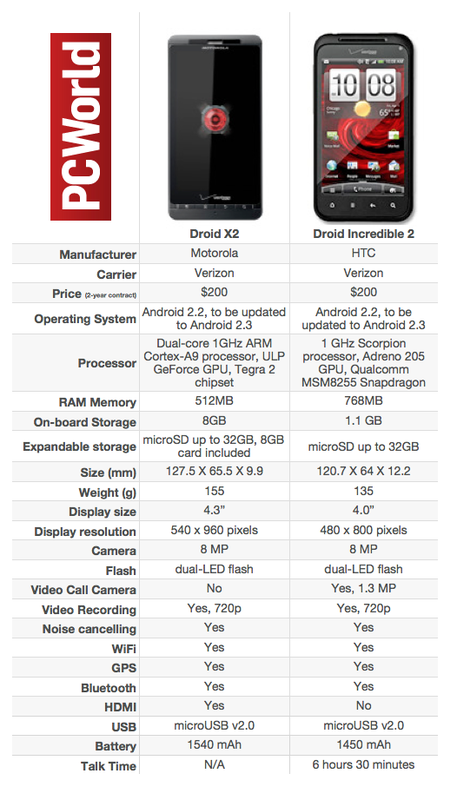 But is the Motorola Droid X2 a match to rival the HTC Droid Incredible 2, which also retails for the same price on Verizon? First off, the bad news: if you were hoping for a new smartphone with the latest Android version available, you're out of luck. Both the Droid X2 and Incredible 2 only ship with Android 2.2, so you're going to have to wait for 2.3, even though the OS was introduced in December 2010. If that doesn't bother you too much, read on. Note, too, that these are not 4G LTE phones, such as the Droid Charge and the HTC ThunderBolt. The Droid X2 has a larger screen (4.3 inches versus the Incredible 2's 4-inch screen), and is thinner--but not lighter--than the Droid Incredible 2. Screen resolution is also better on the Droid X2, at 540 by 960 pixels versus the Incredible 2's 480 by 800 pixels. Although the Droid X2 is basically just a Droid X with bumped up specs, Motorola's Droid packs more punch than does HTC--dual core puncy, that is. The X2 rocks a 1GHz dual-core processor, while the Incredible 2 struggles by with a single-core processor. The Incredible 2 does have more RAM at 768MB (512MB on the X2), but less onboard storage--1.1GB compared to 8GB on the X2. In the camera department, both phones sport 8-megapixel, 720p video cameras with dual-LED flashes. The Incredible 2 also has a front-facing camera, unlike the X2. On the flipside, the X2 has an HDMI-out port. As you would expect from modern Android phones, the X2 and Incredible 2 both feature noise canceling technology and tons of connectivity options, including Wi-Fi, GPS, Bluetooth, and USB. So, should you wait for a Droid X2 or just get an HTC Incredible 2? Until the first reviews and tests of the X2 are out, it's a tough call. But if you don't want a larger screen and you definitely want a front-facing camera, the Motorola X2 is probably not your Droid.